Who is the Author of "The Way of a Pilgrim"? Saint Akakios of the "Ladder"
On the Nativity Fast - When? Why? How? They fill the earth with wonders now as then. Two healing lights from the earth fly up on the first of November. 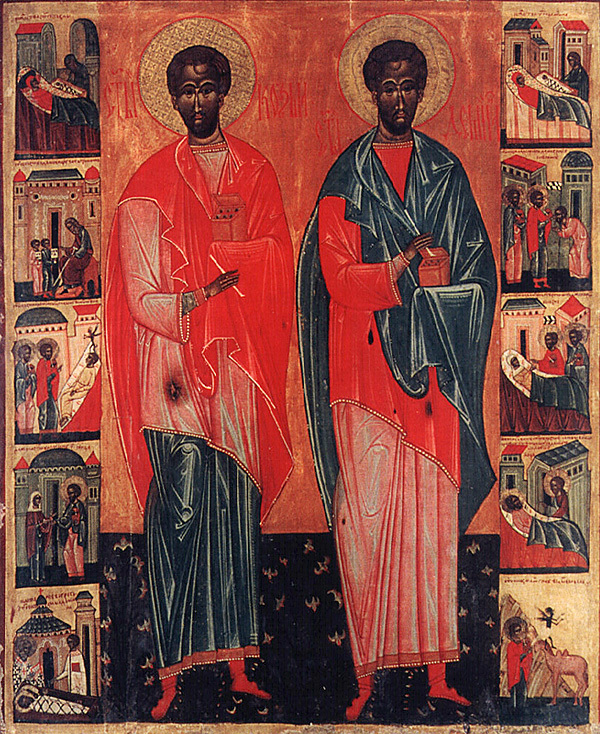 Kosmas and Damian were unmercenaries and wonderworkers. They were brothers both in the flesh and in the spirit, born somewhere in Asia Minor of pious and virtue-loving parents. After their father's death, their mother Theodote (Jan. 2) devoted all her time and effort to educating her sons and raising them as true Christians. God helped her, and her sons matured as sweet fruit and luminaries of the world. They were learned in the art of medicine and ministered to the sick without payment, not so much with medicine as by the name of the Lord Jesus Christ. They were called "unmercenary physicians," that is, unpaid physicians, for they healed freely and thus fulfilled the commandment of Christ: "Freely you have received, freely give" (Matt. 10:8). Once the Saints were summoned to a grievously ill woman named Palladia, whom all the doctors had refused to treat because of her seemingly hopeless condition. Through faith and through the fervent prayer of the holy brothers, the Lord healed the deadly disease and Palladia got up from her bed perfectly healthy and giving praise to God. In gratitude for being healed and wishing to give them a small gift, Palladia went quietly to Damian. She presented him with three eggs and said, “Take this small gift in the Name of the Holy Life-Creating Trinity, the Father, Son, and Holy Spirit.” Hearing the Name of the Holy Trinity, the unmercenary one did not dare to refuse. When Kosmas learned what had happened, he was very grieved, for he thought that his brother had broken their strict vow. On his deathbed he gave instructions that his brother should not be buried beside him. Damian also died shortly afterward, and everyone wondered where Damian’s grave should be. But through the will of God a miracle occurred. A camel, which the Saints had treated for its wildness, spoke with a human voice saying that they should have no doubts about whether to place Damian beside Kosmas, because Damian did not accept the eggs from the woman as payment, but out of respect for the Name of God. The venerable relics of the holy brothers were buried together at a place called Phereman, and a church was erected there in their honor. The holy brothers were great wonderworkers both during their life and after their death. There lived at Phereman, near the Church of the Holy Unmercenaries Kosmas and Damian, a certain man by the name of Malchus. One day he went on a journey, leaving his wife all alone for what would be a long time. He prayerfully entrusted her to the heavenly protection of the holy brothers. But the enemy of the race of mankind took on the appearance of one of Malchus’ friends, and planned to kill the woman. A certain time went by, and this man went to her at home and said that Malchus had sent him to bring her to him. The woman believed him and went along. He led her to a solitary place intending to kill her. The woman, seeing that disaster threatened her, called upon God with deep faith. Two fiercesome men then appeared, and the devil let go of the woman and fled, falling off a cliff. The two men led the woman home. At her own home, bowing to them deeply she asked, “My rescuers, to whom I shall be grateful to the end of my days, what are your names?” They replied, “We are the servants of Christ, Kosmas and Damian,” and became invisible. The woman with trembling and with joy told everyone about what had happened to her. Glorifying God, she went up to the icon of the holy brothers and tearfully offered prayers of thanksgiving for her deliverance. 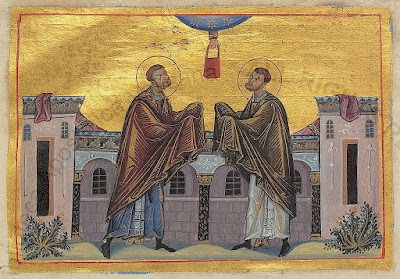 And from that time the holy brothers were venerated as protectors of the holiness and inviolability of Christian marriage, and as givers of harmony to conjugal life. Once a snake crawled through the mouth and into the stomach of a certain farm laborer during his sleep, and the unfortunate man would have died in the greatest pain had he not, in the last moment, invoked the help of Saints Kosmas and Damian. Thus, the Lord glorified forever the wonderworking of those who glorified Him on earth by their faith, purity and mercy. Portions of their relics can be venerated today at the Athonite monasteries of Dionysiou and Pantocrator. 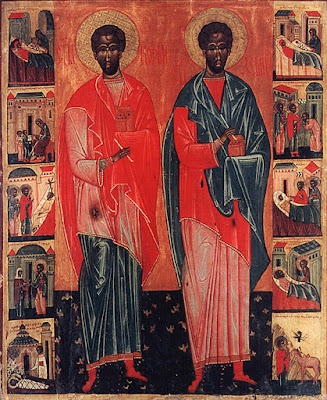 The Unmercenary Saints Kosmas and Damian of Asia Minor should not be confused with the Unmercenary Saints Kosmas and Damian of Rome (July 1), or the Unmercenary Saints Kosmas and Damian of Arabia (October 17). O holy unmercenaries and wonderworkers, visit our infirmities. Freely you have received, freely give to us. You have received the grace of healing: give health and strength to the needy, O glorious and wonderworking physicians. Through your care for us subdue our enemies, and heal the world through your wonderworking. Receiving the grace of healings from God, blessed Unmercenaries, you cure diseases and heal all those who faithfully have recourse to your godlike shrine; and therefore with one voice we worthily call your holy memory blessed.